Now that it has a name, Warner Bros.’ DC Comics-themed streaming service DC Universe is really starting to come together. We’ve known about the live-action Teen Titans show and the return of animated series Young Justice for about a year now, and since then we’ve heard about a Harley Quinn cartoon, a show set in Metropolis before Superman showed up and started doing his hero thing, and a live-action Swamp Thing show from horror producer James Wan. Today, DC has also announced a live-action drama based on Doom Patrol, arguably the publisher’s weirdest super team and the focus of an iconic run in the ‘90s from Grant Morrison. A press release from Warner Bros. says Doom Patrol will be about a team of super-powered people who have all been scarred and traumatized by various tragedies until someone known as The Chief comes along and enlists them in a mission to investigate “the weirdest phenomena in existence.” In an interesting twist, Doom Patrol will take place after the Titans show, with Teen Titan Cyborg playing some role in bringing this weird team together. 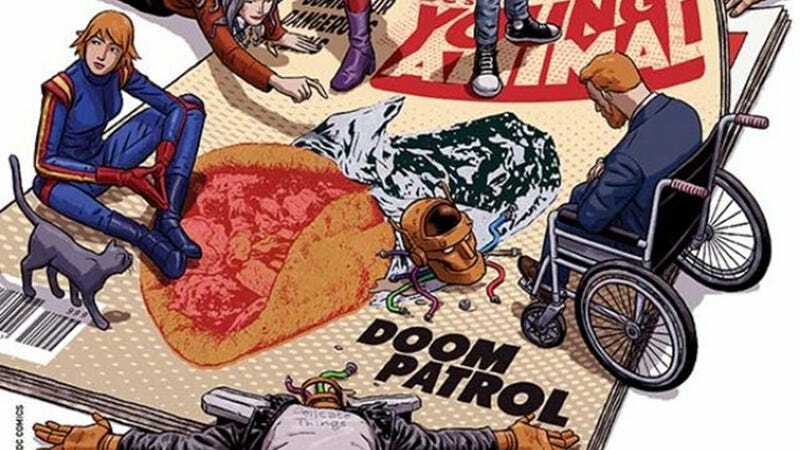 Doom Patrol has been picked up for 13 episodes, and it will debut next year. On another interesting note, Doom Patrol comes from producer Greg Berlanti, bringing him to 14 live-action scripted dramas that are all on the air at the same time. That’s a new record for any one producer, smashing a previous one set by Aaron Spelling and Jerry Bruckheimer—who both topped out at 10 like chumps.